Dog nail clippers, at least the very best ones, usually look more like something you’d find in a toolbox than a grooming kit. Don’t let that be intimidating, because these are a very important tool. Having a bad pair of dog nail clippers and trying to use them on a nervous dog, especially when it takes several tries to clip anything, is just a bad experience from start to finish. You’re not going to be looking forward to it, your dog is going to pick up on that, and it’s going to be a nightmare to try to trim their nails! On the other hand, when you have the right tool for the job, everything becomes a lot easier. But how can you choose the right nail trimming tool? How do you know if it’s going to be good or not? Well, we’ve taken a look at some of the most popular dog nail trimmer options out there, and some of the lesser known options as well, to curate a short list of the very best nail clippers for dogs to get you pointed in the right direction. These are one of those very basic models we were talking about. They almost look like garden sheers. They come in a small/medium size, and also large. If you follow the link above, you’ll find the large ones, but you can also select small/medium before you check out if you’ve got a smaller dog. 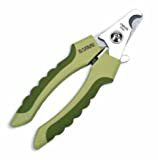 You always want to find a pair that’s sharp, because it makes the process so much easier, so you aren’t sitting there trying to use all of your might to clip the nails while your dog picks up on the tension, gets uncomfortable, gets fidgety, etc. It’s just so much safer for your clippers to be much sharper. It’s like kitchen knives – the sharper they are, the safer they are, even if that seems kind of counterproductive at first. This particular pair by Safari Pet Products is extremely sharp, so that’s one big check-mark in its favor. Next, these are one of the most affordable dog nail trimmer options out there. How often is it that the best product is also one of the cheapest? Granted, there are some less expensive ones, but when you look at the cost, it wouldn’t make any sense at all to try to save a couple bucks when you can get one of the most highly rated clippers for dogs for such a bargain. The handle is comfortable enough that it’s not like your hand is going to get sore while you’re using it, unless you’re predisposed to that, of course. 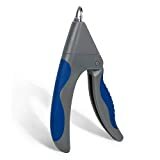 In any case, stuff like the grip on the handle isn’t a huge deal, the main priority is being able to quickly trim your dog’s nails without any fuss. And these nail clippers allows you to quickly trim your dog’s (or cat’s) nails quickly without any fuss, so what else could you really ask for? If you’re in the market for a great set of dog nail clippers, you should definitely start with these. It’s very, very unlikely that you won’t be very happy with your purchase. There are pros and cons to having this safety barrier, but many of the most highly rated and best clippers seem to NOT have this shield on them, for what it’s worth. It can also give a false sense of security, since following the shield doesn’t guarantee you won’t cut too deep, so you’re better off looking and paying attention instead of relying on an arbitrary guard. Here’s a different style of nail clipper. The first ones we looked at are called “scissor style” for obvious reasons, because they cut like scissors. This style is called guillotine, because it has a blade that slides down like a guillotine would. Don’t let that scare you, these are a viable alternative. This model has comfort grip handles, which once again isn’t a huge deal and not the biggest selling point, but it doesn’t hurt, either. The biggest selling point here is the sharp steel blade which makes trimming the nails in one swoop a lot easier than not having a very sharp blade. We feel like you have a little more control with the scissor-style, but it comes down to preference, and whatever gets the job done for you is going to be the best option! If you don’t mind spending a little extra to pick up both styles, you’ll be able to find out first-hand which you and your dog prefer, but if you’re only going to get one and you aren’t sure which to go with, we would lean you towards trying out the scissor style first. What Other Dog Nail Clipping Options Are There? Finally, you’ll want a nail file for your dog as well, for smoothing things out after you’ve clipped them. If you go with the green clippers from Safari Pet Products that we’ve featured above, why not grab the matching nail file for your pup? One again, it’s an affordable product with excellent quality standards, that’ll help you get the job done quickly and easily. What more can you ask for from a grooming tool? If you’re having a tough time, even with all of the right tools, here are some tips that you can try that should help make the process easier. Don’t worry, it’s totally normal to struggle with this, just try not to get too discouraged because your dog can pick up on the negative feelings and they’ll think this is a much worse thing than it really is. The best time to trim you dog’s nails is right after a bath, so the nails have been soaking and are going to be softer. You may want to weight the pros and cons if you have a dog that hates bath time and hates getting their nails trimmed, because that can aggravate things further. Just remember that when you do this can be as important as how, and you know your dog better than anyone else, to try to choose a good time! We’ve mentioned this several times already, but it bears repeating for anyone who comes right to the bottom for tips. Try to stay calm, relaxed, and don’t make a huge deal out of clipping the nails. It’s good to start when the dog is younger, even if they don’t need the clipping right away, you can still go through the motions to get them used to it from a young age, so it’s not some new scary thing they’re seeing later on. Don’t cut too much off, especially if the nails are darker. There’s a part of your dog’s paw called the quick, that comes right before the part of the nail that you want to cut off, and if the nail is dark it can be hard to see. Cutting the quick (or “kwik”) will cause the dog a lot of pain, and cause them to bleed, and will make it very difficult for them to trust you with this again. If you can see the quick in light nails, you can make one cut and you’re done. With dark nails when you cannot see the quick, start by cutting off just a tiny bit at a time. It’s a longer process, but you really need to make sure you aren’t cutting your dog! Here is a great resource with more information on how to correctly trim your dog’s nails. Patience is VERY important! Sometimes, it’s a multi-day process to slowly trim the nails to ensure there’s no pain or bleeding, so having the best dog nail clippers for the job is a good idea. You could take your dog in to a vet to have this done as well, and if the nails are very long and starting to curl into your dog’s paw. It’s a good idea to have a professional take care of it since there are other risks at that point, including unnecessary pain, that a vet can help with. Otherwise, this is typically something people do at home, and once you get the hang of it, it’s really not a big deal anymore.